Lindsay and I were very surprised that with such a short lead up time to the meet from when we decided to plan another Qld meet that we had a roll up of 21 camps come to participate. To clarify why we chose to organise the meet with short notice, we were sitting around with a few of Queensland regulars at a birthday camp early February and got talking about a fellow member who nearly made it to the Australia Day Meet and broke down less than a kilometre from the venue with a stuffed clutch. Greg as the host of the Canungra Aust Day Meet did the host thing and contacted Richard and Julia to see how everything went and Richard said car was all fixed and he wished there was another camp soon before his planned trip to the tip later in the year. So we need to blame them for the short turn around for the second Queensland meet. What an excuse for a meet. Andrew Drynan has been a venue for many Queensland meets since we have been members of the group although it had been a couple of years between visits this time. 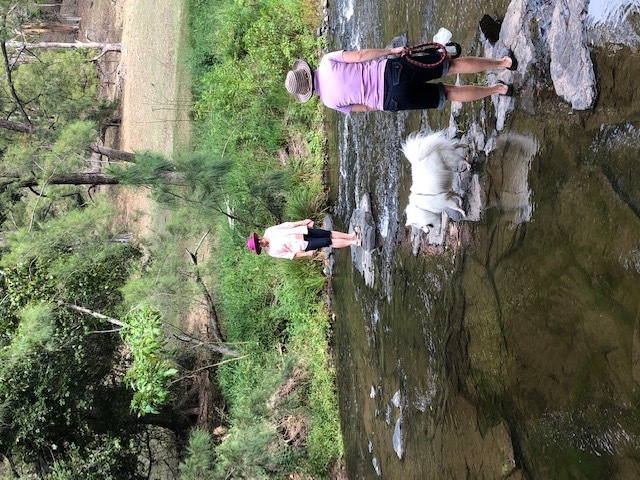 It is such a pretty place to camp, the many views of the hills as the day progresses just makes it so special as well as the stream to cool down on hot days. There are also many drives around the area with such great scenery. Morning tea on Saturday had everyone walking up the hill to the trees so that we could fit 40 odd people in shade. New members Gary (Gary number 3 for the meet) and Marian arrived for their first meet just as morning tea was happening. After greeting them, they pulled up, put fridge on power and wandered over to morning tea before setting up camp. As hosts we were really thrilled when they left on the Sunday that they said they were so happy to come to a group that made them feel so welcome. With people even coming up to their camp to chat . Such a good feeling as we always try to include new people to the group. Many people made use of the afternoon to go and sight see around the area, think the air conditioned cars may have been a bigger incentive. Some made use of the water holes in the creek or sitting under a shady tree. Night time found everyone joining around the fire, one really just to look at so didn’t matter that the circle was made bigger and bigger. The night was even more special as we had a couple of birthday cakes to share around the fire to celebrate Matt and Gus’s birthday, something neither of them knew was happening. Sunday, many people left to go home, some did more sightseeing of the area staying the extra night and some just sat in the pools to cool down. Thanks everyone for making the weekend special and we look forward to another meet sometime soon and if it is one we put on will certainly remember to check diary first so it does not clash with purchased concert tickets although the Eagles we’re absolutely fantastic to see once again. We were lucky Greg and Lisa were staying a couple of more days so we left trailer set up on the Sunday to return to camp on the Monday night to make it a extended weekend.